Today started off bright and early as we prepared for the commemorations and ceremonies for the 72nd anniversary of the D-Day lands. We left in the fog of the early morning, and headed towards The Queen’s Own Rifles House (renamed The Canada House). The crowds began to mount around the front of the house on the boardwalk, and the ceremony began promptly at 08h03 to commemorate those that landed at the beach as this time over 70 years ago. 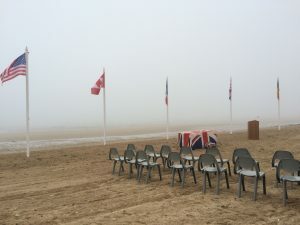 It seemed as though the majority of the crowd were locals that lived in the town that was controlled and liberated from the Nazis by the Allies – with the Canadians and British being highlighted for their participation at Juno Beach. The ceremony was done by a variety of school aged children and teens, who read prepared speeches and recited “You Gave Me Time” in remembrance of Garth Webb. We finished the ceremony with the national anthems of France and Canada. After talking with a local priest, it was decided that we would move about 5 minutes down the beach to Saint-Aubin to partake in the local ceremony there. 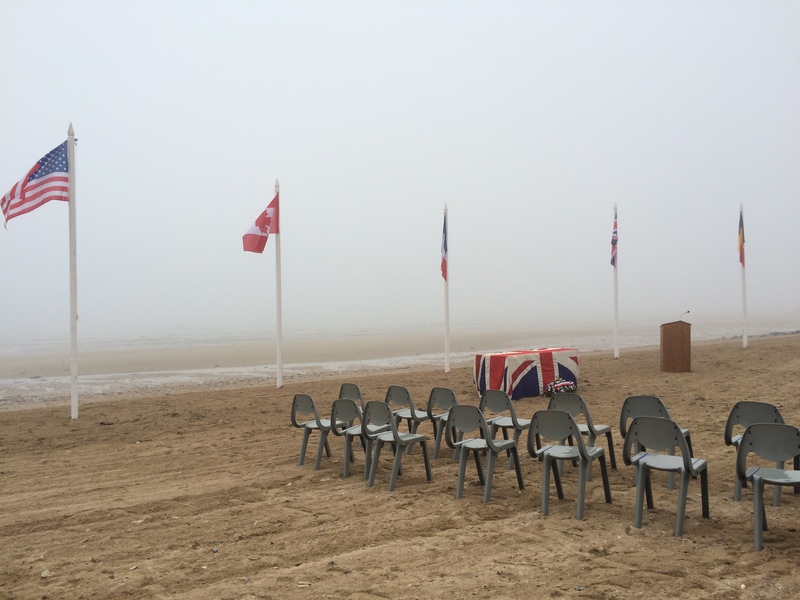 It was moving to see those acting on behalf of the Commandos place crosses on the beach for those who had died on that beach. In addition, the mayor gave a gerbe that was placed in the ocean in remembrance of the fallen soldiers. From here we went to the Juno Beach Center, which was very busy. We were handed a pamphlet describing the proceeding’s of the ceremony, and sat as we heard speeches from Nathalie Worthington, the Director of the Juno Beach Centre; Colonel Guy Maillet, the Defence Attaché from the Embassy of Canada in Paris; Don Cooper, the President of the Juno Beach Centre Association; and Frederic Pouille, the Mayor of Courseulles-sur-Mer. What was truly moving was that we were able to shake the hands of Veterans following the ceremony, and thank them for their service and bravery on D-Day. After the ceremonies in the morning, we were able to digest all that we took part in, and spend the warm, sunny (finally!) afternoon in Bayeux. We were able to see the Bayeux Tapestry, and learn about the conquest of William the Conqueror and the Battle of Hastings. From here we were free to wander the streets, and given time to buy souvenirs and step into antique shops. After this, we headed back to the Moulin to quickly change for the evening events. We then made our way to the Canadian Cemetery at Beny-sur-Mer. There was a large collection of people there to honour some of the Canadians that died in the Normandy Campaign. The ceremony involved the laying of wreaths and the singing of the national anthems. From here we were provided Canadians flags by The Juno Beach Center to put at all the graves in the cemetery to show our appreciation. Following this, Brad gave an extremely moving presentation of his great, great uncle Private Abraham Dufresne. We then made our way to a dinner at the Canada House. We learned about the history of the house, and the landing of the Queen’s Own Rifles at 08h03 on June 6th. They discussed how the House’s Association and Owners are committed to ensuring that the role the Canadians played in the liberation of Normandy is always remembered. After dinner, the ceremony commenced with bag pipes. The most moving portion of the ceremony was when spectators were given flowers to toss into the ocean. Overall, the day was quite moving. We were able to see those with a dedication to keep the memory alive, the younger relatives representing Veterans, as well as Veterans themselves. Each of the ceremonies were quite unique, and it was interesting to see the different forms of commemoration – whether it was a small intimate ceremony, or a larger affair. I think we were each reminded of the true sacrifice made by these men, and were affected by the stories and poems that were shared. It truly solidified why we are here, and why it is that we care and study the sacrifices made by the men this day 72 years ago, those during the war of 1939-1945, as well as those during the Great War.